One of the healthiest and delicious South Indian delicacies is idli. Idli is a very simple snack to prepare. Adding spinach will enhance the nutritional value of idlis. 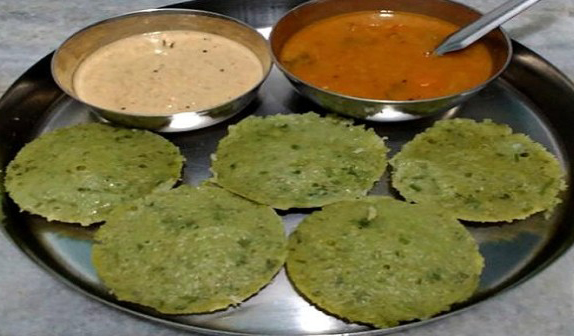 This healthy snack will allow your kids to have health benefits of spinach in idli. One of the healthiest and delicious South Indian delicacies, idli is a very simple snack to prepare. Although idlis are a very healthy snack and one can easily make idlis at home. It doesn’t take much effort and can be a weekend snack for your family. Now, idlis can be prepared with variation. Let’s try something different and add more health to already healthy idli with spinach. Yes, adding spinach will enhance the nutritional value of idlis. 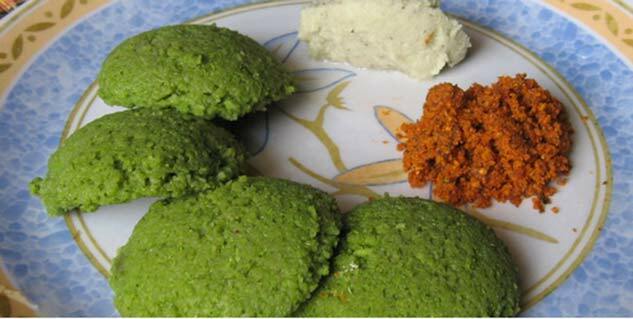 This healthy snack will allow your kids to have health benefits of spinach in idli. Soak the rice and urad dal for about 7 to 8 hours. Then mix and make a smooth paste. Add soda and so that it cab ferment, leave it again for 4 to 6 hours. Now, add salt and again mix properly. Separately, boil the palak leaves and then make a paste. Now, mix this palak paste in idli batter. Grease the idli tray with ghee and set the idlis in idli tray. Let the idli steam for 20 minutes. Do not open the cooker right away. Serve with sambhar and chatni.